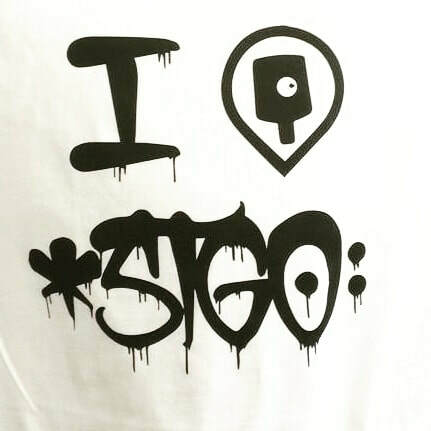 Stgo (Pronounced Santiago) Street Art Tours! - FAQ by a guy "from Santiago" who can't stand us. It's mutual, buddy ¬¬. According to Nat Geo (that's right, the one with the yellow frame), Santiago is one of the best places in the world for street art and graffiti... and we're the ones you want to be walking around with, because we're tattoed and yelling in the middle of the street, so, we blend in with the people who normally rob tourists. So, we decided to meet with many artists from every end of the city; we might have painted in a couple places we weren't supposed to (according to the police); we made sure to walk through various areas of the city (and almost got mugged here and there/ yes, that's very ironic), and finally, we designed a series of routes that aimed at bringing our clients closer to this marvelous underground world. Now, local Santiagoanians (that's probably not a real word) will take you through the city and show you their streets, tell you their stories, and explain their history, as well as the techniques being used here to paint the walls of the Capital of Chile. ...or go to one of the many Cafes Con Piernas and ask for a Machiatto-expresso with one-and- a-half teaspoons of brown sugar and cinnamon spice on top (good luck with that). PSSSST! We have Group Walking Tours, every day at 10:30 and 15:30 in Barrio Bellavista and Barrio Yungay... See More! From San Miguel to Yungay, you'll go all city to see the best street art in the city, all in the commodity of a private vehicle from and to your accommodation. Ride through three of the best graffiti districts taking pics and peddling like there's no tomorrow. This tour will take you through Bellavista, Yungay, Brasil, and Estacion Central in a 3 hour tour, meant to keep you entertained at all times. Our local artists will be your instructors in order to teach you how to paint and leave your mark on a Wall of Santiago De Chile. They'll also teach you to be careful with "133".